Veteran NFL quarterback Matt Hasselbeck has been around big-time football his whole life, even roaming the sidelines as a high school ball boy while his father, Don, played tight end for the New England Patriots. So you can believe it when he says that, despite the game’s big budgets and slick production, not much has changed in the way of technology—even those in-helmet speakers that help coaches signal the next play are antiquated. 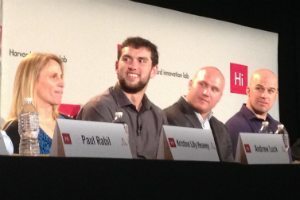 Hasselbeck and other top athletes were getting a taste of technological innovation this week in a visit to Harvard’s Innovation Lab and a meeting with MC10, a Cambridge, MA-based company developing new uses for flexible electronic circuits, including wearable sensors for monitoring the body. The athletes, who are part of MC10’s sports advisory board, discussed the roles that advanced sensors and data analytics might be able to play in sports. Their hoped-for uses ranged from fun ideas like displaying players’ biometric data on TV to serious matters of health and safety, especially for young athletes. Since they’ve spent years being poked, prodded, weighed, measured, and examined, athletes are keenly familiar with the science behind keeping their bodies in top physical form. “My job was to be the healthiest person in the world,” said Angela Ruggiero, a former U.S. Olympic hockey team defender. So with even more intimate data about the body’s performance under pressure, coaches and athletes might be able to find new insights about the factors behind playing in “the zone,” that elusive level of athletic ease when the game slows down and everything comes together seamlessly. The recent surge in attention for wearable sports sensors has included a focus on head-injury monitoring technologies, and for good reason. The NFL recently settled with its players union in a lawsuit alleging the league didn’t do enough to protect players from concussions and other brain traumas, and has also changed its rules to protect players’ heads in violent collisions. Meanwhile, doctors at Boston University are studying the effects of long-term head collisions among athletes and have signed up a growing roster of big names who are donating their brains to the research after death—a group that includes Hasselbeck’s NFL veteran father. Taylor Twellman, a former star for Major League Soccer’s New England Revolution who was forced to retire in 2010, at age 30, after suffering multiple concussions, has criticized his former team’s medical staff for allowing him to continue playing after taking blows to the head. He said parents will likely drive the adoption of new technologies as they become more aware of the dangers of head injuries. “All of us in here were once youth athletes. That’s where electronics has the greatest impact on anything, because its going to give the parents the data and the tools to make the right, educated decision about what’s best for their kids,” Twellman said. Better monitoring would be welcome at the professional level, too. Hasselbeck said players can be to blame for falling into the tough-it-out habit of concealing or downplaying injuries. But he said team doctors also can push players too hard sometimes.